Close 5:00 p.m. 5:00 p.m. 5:00 p.m. 5:00 p.m. 12:00 p.m.
From The Woodlands: Our office is adjacent and to the south of Hermann Memorial Hospital. 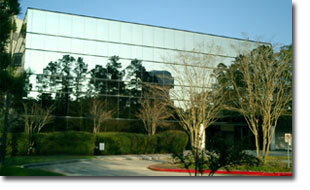 From the north of The Woodlands and Hermann Memorial Hospital: Come south on I-45, take the Tamina Rd./Research Forest Dr. exit (#77) off of I-45, come down the southbound feeder road and past Research Forest Drive, get in the right hand lane, continue on the feeder road and turn right onto Medical Plaza Drive which is the third street after you pass Research Forest Drive (there is a granite sign for Medical Plaza Dr. at ground level). Turn right at the fourth driveway and park in the garage which is on your right. Come into the connected office building which is to the left when you enter the garage, take the elevators in front of you to the second floor, and our office is slightly to the left after you get off the elevator. From the south of The Woodlands and Hermann Hospital: Come north on I-45 and take the Lake Woodlands Dr/Research Forest Dr./Tamina Rd exit (#77), go north on the feeder road and take the first u-turn to the left under the interstate to go south on the feeder road, get in the right hand lane of the feeder road and turn right onto Medical Plaza Drive which is the third street after turning onto the feeder(there is a granite sign for Medical Plaza Dr. at ground level).